Until 1800 pack animals and sledges conveyed goods to Zennor as, remote and inaccessible by the natural features of land and sea, there were no roads. This isolation gave the area long continuance with ancient implements and customs. Against this background Colonel 'Freddie' Hirst started gathering together relics peculiar to Zennor which led to the richness of the Wayside Museum collection. Now, over 60 years later, the collection has over 5,000 items in 16 display areas and includes an extensive collection of photographs and information on people who have lived in the area. So much to see, but what makes this museum so different is that many of the exhibits can be handled, so that visitors can experience how the items were used. We regret no dogs are allowed except guide dogs. 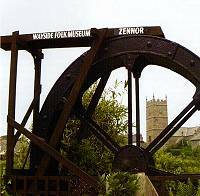 Zennor is situated on the B3306 coast road, 4 miles west of St. Ives.